SEC Tournament primer: Can anyone derail Gators in Atlanta? 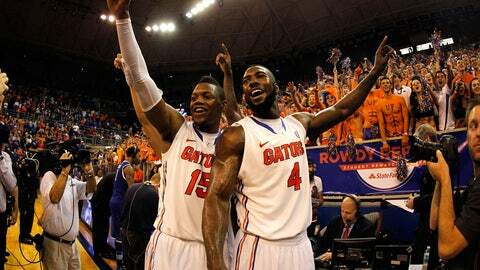 The Florida Gators became the first SEC team to ever go 18-0 in conference play. Down through the years, the Southeastern Conference Tournament has been dubbed the UKIT — as in, the University of Kentucky Invitational. After all, the Wildcats have won it 27 times. The league’s 13 other teams have combined to cut down the nets 26 times. That includes just three titles — in succession, from 2005-07 — by top-ranked Florida, which just ran the table on the SEC regular-season schedule. Coming off an 84-65 blowout win over Kentucky for its 23rd straight win, Florida (29-2) became the first team to go 18-0 in SEC play. The Gators hope to parlay that regular-season dominance into a fourth SEC tourney crown to earn the NCAA Tournament’s No. 1 overall seed when the bracket pairings are announced come Selection Sunday. After the Gators won the SEC by a whopping six-game cushion, the question for the 13 other league teams still remains: can anybody derail the Gators in Atlanta? As the top seed, Florida has a double-bye and opens up play on Friday in the quarterfinal round against the winner of Missouri (21-10) and Texas A&M (17-14). "It’s the next step in our season right now," Florida coach Billy Donovan said. "The regular season is over with. Everybody in the league starts out and it’s 0-0. It’s kind of a new season, so to speak, over a five-day event." Florida is one of the more-experienced teams in the country, led by a quartet of seniors — guard Scottie Wilbekin, forwards Casey Prather and Will Yeguette, and center Patric Young — that have combined to win 113 career games and counting. That includes a program-best 32 straight wins at home stretching back to last season. When the SEC announces its annual awards on Tuesday, Wilbekin is the leading candidate for conference’s Player of the Year award, while Donovan has to be a shoo-in to be named SEC Coach of the Year for a third time in four years. "When you invest four years like these guys have invested," Donovan said of his seniors, "it means something to them, and they’re going to carry it with them for the rest of their lives." Kentucky (22-9) is the tourney’s No. 2 seed, followed by No. 3 Georgia (18-12) and No. 4 Tennessee (20-11). Those three programs also receive double-byes into Friday’s quarterfinal round. "You have to understand, (Florida) is really good," Kentucky coach John Calipari said after Saturday’s game. "That team just shot 60 percent (from the floor) and 60 percent (on 3-pointers). That doesn’t happen to us." Along with Florida, Kentucky is the only other SEC team that is a lock for an NCAA tourney at-large berth. The Wildcats field the youngest team in the nation, often starting five freshmen, including standout forward Julius Randle. But they limped down the stretch and fell out of the top-25 poll this week after losing three of four games, including an overtime home loss to Arkansas and a road loss to lowly South Carolina. After closing by winning four straight games and five of six, including a 72-45 blowout Saturday of visiting Missouri, Tennessee has apparently jumped from the NCAA tourney bubble into lock status. The Volunteers have a national Ratings Percentage Index (RPI) of 44th nationally, according to NCAA.com. Then again, winning at least one conference tourney game will certainly guarantee NCAA tourney inclusion. The Vols open play Friday against the winner of Thursday’s game between Arkansas (21-10) and either Auburn (14-15) or South Carolina (12-19). "They obviously know they’re good enough when you have the parts to be successful," Tennessee coach Cuonzo Martin said of his team. "Now, it’s just a matter of doing it. We’ve been here before. It’s just a matter of doing a job when you have the parts to do it. As long as we continue to play the way we’re playing, I wouldn’t mind playing anybody. It doesn’t matter who we play." Looming large is Friday’s potential quarterfinal match between Tennessee and Arkansas, which is sitting squarely on the NCAA tourney bubble following Saturday’s disappointing 58-53 loss at Alabama. Before that loss, the Razorbacks had won six straight games and eight of nine, but their RPI ranking of 62nd is shaky at best. In fact, Missouri has the league’s fourth-best RPI at 52nd. But the Tigers only went 9-9 in league play, were swept by Georgia and have bad league losses to Vanderbilt, (15-15), Ole Miss (18-13) and Alabama. While Florida is the prohibitive favorite to win the SEC tourney, Donovan feels that whichever team claims the title (and the league’s NCAA automatic bid), plus the runner-up, if it also is NCAA tourney-worthy, are put at a distinct disadvantage because of the late start of Sunday’s title game. That would be compounded should the team(s) be scheduled to open NCAA tourney play the following Thursday. "I like playing the conference tournament," Donovan said. "I think it gets you ready for postseason. I like the fact that it’s a one-and-done event. You’ve got to play really, really well in order to advance. … I think the one thing the NCAA has to look at is any conference that’s playing their conference tournament and it goes into Sunday, those teams, in my opinion, should not play in the NCAA Tournament until Friday." Better yet, according to Donovan, the SEC should consider wrapping up its tournament on Saturday. "Are we better off backing up our conference tournament and ending it on Saturday? Just end it on Saturday and give everybody Sunday off and figure out who’s in the tournament and who’s not and move from there," Donovan said. "But it becomes very difficult when you’re asking these kids to play Friday, Saturday, Sunday. In some instances, you could be asking teams to play Thursday, Friday, Saturday, Sunday. Some of these teams, if they keep moving on, could play five straight days and then you come back and play (the following Thursday). That’s a challenge to look at."